The Russell Hobbs Halogen Oven, 11 Litre capacity ( smaller than average) and with the extender ring this goes to 16 Litres. As long as you are aware of these few drawbacks, the unit will perform well . The Russell Hobbs brand has been let down a little with this model, the manufacturer is Spectrum Brands. 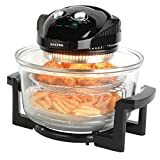 I have had a Russell Hobbs halogen oven since January this year and am immensely pleased with it, always cooks to perfection and is well used by the family. HOWEVER I am very irritated with the quality of the display numbers on both dials, they have almost rubbed off we only use mild detergent and not aggressive in our cleaning, name= Russell Hobbs also worn off. I may be sound very fussy but I look after my Kitchen appliances and like them to look as good as the day I bought them. Hi Marion, yes i’ve seen some of the quality issues for myself, on several different models, it is unfortunately part of our throwaway culture, even if a new pair of control knobs are ordered, I doubt they would have been altered in production to be any more robust. Part of the problem is that the far east factories rush into production of new models so fast it becomes impossible to even stock spare parts for all but the most expensive models, so many are thrown away for want of parts costing only pennies….. It irritates me too ! I was thrilled with this as I cant use an ordinary oven restricted mobility. First all the numbers were rubbing off. then it got a bit noisey. then two white sparks and oh no : ( it’s not working the light no longer comes on. I really miss it and wonder if it can be repaired, also is it worth it? Oh dear! Not what anybody wants to happen. The sparks is most likely the lamp element blowing. I know several people have asked me about noise, mine is the Andrew James model that I highly recommend on these pages and I had a Supermarket brand model a couple of years ago, both have been very quiet and reliable, but it sounds like the motor is rumbling as well as the element failure, probably best to start again. Any competent electrical repair shop can replace the element and it should be a reasonable cost, but when the motor is also suspect, I have to say its time for a new one. is it meant to do that?